You can play iTunes videos on iPod Touch, iPad Mini, iPad Air, iPad 4/3/2/1, iPhone 6s, iPhone 6 Plus and the former iPhone types, Apple TV and other device produced by Apple Inc. It is hard for you to play iTunes movies and TV shows on common players due to DRM protection. DRM, short for Digital Rights Management, is produced to control the duplication and dissemination of the iTunes music or video files. Although you have purchased or rented the files, Apple DRM protection protects you playing iTunes video as you wish. It is unfair. If you want to play iTunes DRM protected videos freely, you need an iTunes video Converter to help you. M4V Converter Plus is such the right tool for you. It is a professional iTunes video converter yet iTunes DRM removal tool. It is easy to remove iTunes DRM and convert iTunes video to unprotected MP4, MOV and other common video formats without quality loss. 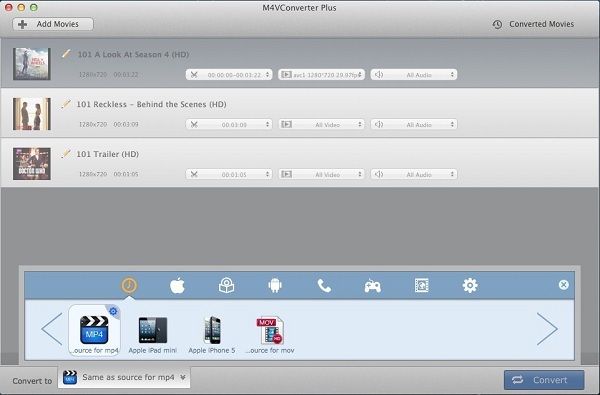 M4V Converter Plus can support converting purchased iTunes movies and TV shows. Keep iTunes Rentals for longer time. This program can remove DRM from iTunes Rentals and convert iTunes rented movies to common video format. In this way, you can keep iTunes Rentals for longer time than Apple officially requirements. Convert DRM M4V to Various video formats. M4V Converter Plus allows you to convert iTunes movies and TV shows losslessly to various video formats, such as MP4, MOV, AVI, WMV, etc. It can also extract audio from iTunes videos and save as MP3, AAC, WMA, FLAC, etc. The software makes M4V video batch conversion simple. Create a batch list of m4v video from iTunes library and convert them all to a single selected format one by one. The output videos quality is very good. It can convert DRM protected movies or TV shows to almost popular video formats which can compatible with Apple and Android devices well with original quality output. With intuitive user interface, this software is very easy to use. DRM M4V conversion progress will be finished within several clicks. 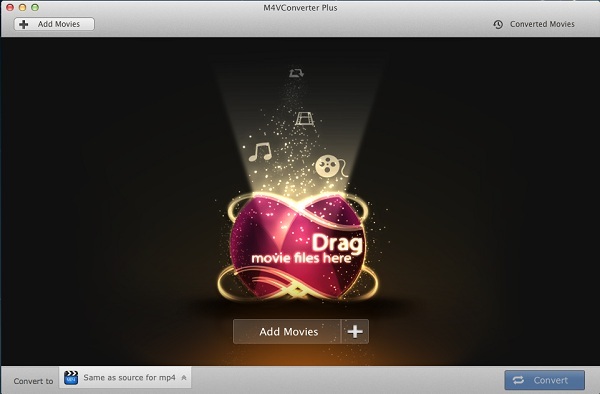 Step 1: Free download M4V Converter Plus for Mac, install and open it. Before the conversion process, please make sure you have already downloaded and installed the latest version of iTunes on your computer. Step 2: Add iTunes DRM video to the program. Now you need to import the video you want to convert from iTunes library. Click Add Movies button to choose iTunes movies or TV shows as you need. Step 3: Choose suitable output format. Click on the Convert to profile drop-down lsit on the bottom left of the main window. You can choose Same as source for mp4 as output format. Besides, other more popular video formats are available according to your special needs. After all settings done, please hit the Convert button to start iTunes M4V to MP4 conversion.